Microsoft has renamed its instant messenger client several times in the past ten years or so and Windows Messenger (Windows Live Messenger, MSN Messenger) comes in automatically with every installation of a Windows operating system, it does not show up in "Add/Remove Programs" in control panel. 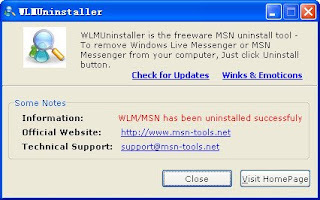 WLMUninstaller can be used to uninstall the initial version of Windows Live Messenger from the Windows operating system or uninstall another version of the instant messenger even if it is broken or otherwise damaged. To remove Windows Messenger, Windows Live Messenger or MSN Messenger from your computer, run WLMUninstaller and click Uninstall button.